Counting Cranes: Will wind energy and hunting impact state population? DELTON, MI — The evening sky took on a surreal quality not unlike a scene by Japanese film director Akira Kurosawa. A dull gray ceiling had transformed in just a matter of minutes to an explosion of orange, yellow and purple, flooding the lakefront with a post-apocalyptic light. To add even more drama, there were cranes flying in. Small flocks hung in the sky over the lake, calling in their unmistakable tongue, part trumpet, part purr, part rattle and croak, a language that has fascinated man for centuries. Standing nearby, bundled up to ward off cold, Tom Funke was counting them on a clicker he held in his hand. A pair of binoculars hung around his neck. Funke is the director of conservation for Michigan Audubon Society. He and I had come out for the annual state crane count, an event that provides the U.S. 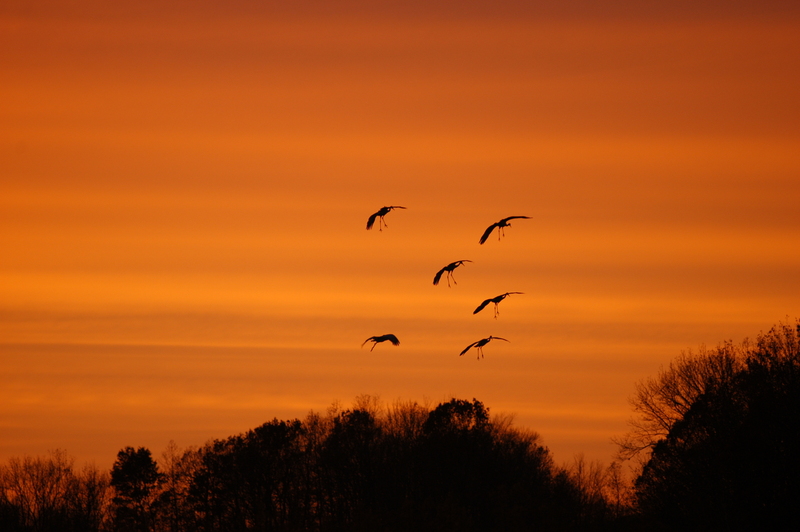 Fish and Wildlife Service with a snapshot of migrating crane numbers. The data help them determine the status of the cranes, which are protected under the federal migratory bird treaty act. Sandhills almost were extirpated in Michigan, having been sought by market hunters for food and by clothiers for fashionable plumage. They were common in Michigan until the 1880s. By 1905, they were nearly gone. other than chit-chat in certain circles, but they are hunted in some other states. Michigan farmers can get federal crop depredation permits to take some if they become an economic nuisance. Sandhills are not currently on Michigan’s list of hunted game species. Wind turbines also are a potential future issue, Funke said. Michigan Audubon supports wind energy development, he said, but siting turbine towers, or those for telecommunications, requires thought about bird species that might be impacted, such as cranes. MAS has contracted with Michigan State University to study the economics of crane watching, too. Audubon’s signature Cranefest event, held at Baker Sanctuary every October, has drawn as many as 6,000 people on a good year. It and the Phyllis Haehnle Memorial Sanctuary in Jackson County are two well-known public crane-viewing locations. 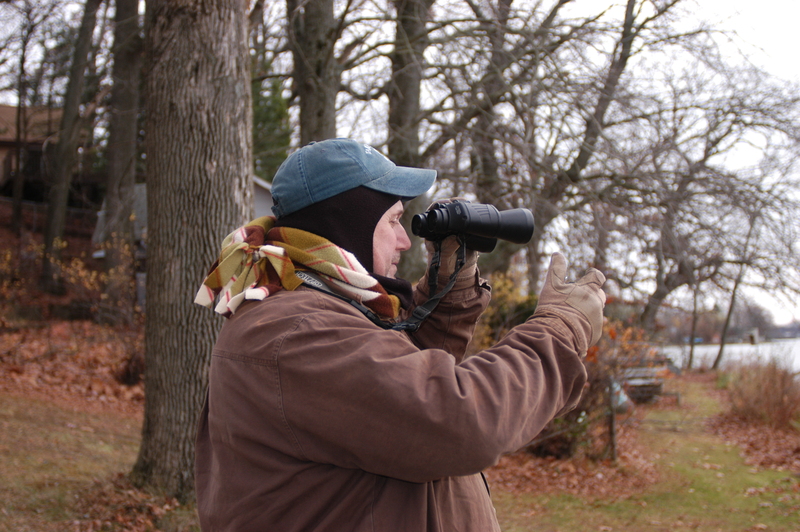 Volunteers at Baker Sanctuary counted 7,663 the same evening we were out, while others at Haehnle tallied 5,012 cranes. The big birds filled the skies with their calls and outstretched wings. Most are thought to breed in Michigan. They were migrating south to places such as Georgia, Florida, Tennessee and Kentucky. Ron Hoffman, author of the sandhill crane section of Michigan’s Breeding Bird Atlas and the Michigan crane count coordinator, said more than 6,000 flew into Haehnle sanctuary a week after the formal state counts. Hoffman is a retired high school biology teacher. He has a master’s degree in wildlife biology and has been counting cranes since the 1960s, considerably longer than FWS, which began its survey in 1979. Sandhills are Michigan’s tallest nesting bird. They are monogamous and can live 20 years. As I stood with Funke watching the cranes that evening, mesmerized by the colorful scene, I thought back on numerous encounters I have had with them, mostly in wild places, often by surprise. I’ve never tired of their majesty and distinctive calls. Sandhill cranes are unique, which is a good reason to protect them. Their successful comeback is because of that protection and the efforts by volunteers who work hard to conserve their numbers. As the evening light show began to fade to black and the merciless cold impressed itself upon us, Funke and I called it quits. We had counted only 73 cranes, not nearly as many as those at Haehnle or Baker sanctuaries, but the night was no less special. For more photos of the count check out the: Crane Count Photo Gallery. This entry was posted in Uncategorized and tagged Akira Kurosawa, Baker Sanctuary, Bird, Birds, Birdwatching, Crane Count, Cranefest, Haehnle Sanctuary, Michigan Audubon Society, Sandhill Crane, U.S. Fish & Wildlife Service. Bookmark the permalink.